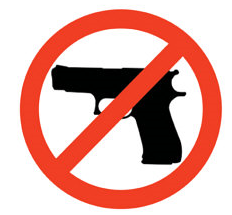 When you see a "no guns" sign do you know how to interpret that particular modern hieroglyph? The above symbol means "The management of this establishment is so terrified of self-responsible humans that in case one of them ignores this deplorable sign and enters you'll find said manager crying like a baby, soaking in pants soiled with his own filth, under the nearest chair." A picture is worth a thousand whimpers. Or, maybe it really means something else altogether. You never know with anti-liberty bigot cowards. If you get any value from my labors, consider rewarding me with your financial support. This blog is in its 10th year now. If you believe I have contributed anything to the conversation regarding liberty during these ten years, and believe I have more to contribute, help me stay online.